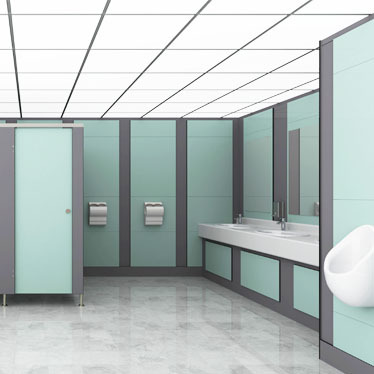 With your cubicles coming together and much of the cubicle hardware fitted, now is the time to choose the cubicle locks and indicators along with accessories to finish your facilities. You will of course need a lock on your cubicle doors and thankfully there are a wide range of indicators bolts and cubicle lock keeps available to suit various requirements, from budget ranges to all-encompassing DDA compliant models. Most indicators also include an integral emergency coin release which sits on the outside of the door. This is an invaluable feature, enabling entry into the cubicle in the event of an emergency. When fitting an indicator bolt to a new door you will also need to install a keep, as this is the part which keeps the bolt in place when slid into the locked position. Keeps are available in a number of different shapes and sizes and are typically sold separately to the indicator lock, enabling you to choose the best product to suit your requirements. Lock keeps are available with an integral buffer but if your keep does not have this feature, don’t forget to install these separately as cubicle door buffers are an essential element which ensures that the keep sits in line with the indicator bolt and therefore enabling the door to be locked! There are a multitude of cubicle fittings and accessories available to choose from when setting up a new cubicle, but perhaps most important to consider are toilet roll holders and coat hooks. Toilet roll holders are a standard user expectation, elevating the toilet roll from the floor providing hygienic facilities and enabling the toilet roll to be within easy reach of the user. Perhaps less commonly considered are coat hooks although they are invaluable for enabling personal belongings to be elevated from floor level within your cubicle. For information on what you need to assemble your cubicles from scratch, check out parts 1-3 of our 4-part cubicle guide, 'Install Cubicle Hardware' , 'Cubicle Brackets and Headrail' and 'Cubicle Hinges and Leg Supports'.